In the most recent edition of the Roman Missal (2002), the ancient “Prayer over the People” at the end of the Eucharist was restored – optional on weekdays of Lent, required on Sundays of Lent. For most people the challenge is to reduce the wordiness of our liturgies, to increase silence, and to emphasise the symbols and what we do. So I am obviously not advocating increasing the wordiness of our rites. But certainly the ancient Western prayers were pithy and penetrating (the shared collects are a wonderful example), and we could do worse than unclutter some of the liturgy, making space for reclaiming some of these ancient treasures. I have tried to find a photograph (online) of the priest’s (or bishop’s) posture at the Prayer over the People. I cannot. In fact, some people will struggle to find the instructions for their use. The Deacon or, in his absence, the Priest himself, says the invitation: Bow down for the blessing. Then the Priest, with hands outstretched over the people, says the prayer, with all responding: Amen. they may be filled instead with delight at your commands. Esto, quaesumus, domine, propitius plebi tuae, ut, de die in diem, quae tibi non placent, respuentes, tuorum potius repleantur dilectionibus mandatorum et, mortalis vitae consolationibus gubernati, proficiant ad immortalitatis effectum. Yes the Prayer over the People for Thursday in the Fifth Week of Lent invites reflection. Of course though today in New Zealand, and a number of other countries, the Feast (Solemnity) of St Patrick takes precedence over the Thursday in the Fifth Week of Lent. Happy St Patrick’s Day! Aren’t they actually ‘Solemn Prayers over the People’? Hard to find any substantial – this post the best I’ve found so far, and thanks – info on these prayers. Why do they replace the blessing? I use them, and like them. Good for meditating on, for sure, and very fitting in this season. Is there a source for researching them, a direction I can be pointed in? Anything further you’ve written on them I’d appreciate, too! Again, thank you for this post. Thanks, Keith. I’m not sure where you are getting that “they replace the blessing”? They are possibly older than the regular blessing by a priest to conclude the Eucharist – but that is possibly another story. Blessings. Thanks for the reply, Bosco. You would use both the Prayer and a Blessing? I get the ‘one or the other’ understanding from LENT HOLY WEEK EASTER and the GREAT FIFTY DAYS by Leonel Mitchell, p 20. That’s why I have replaced the Blessing with the Prayer in Lnen. Only came across these Prayers later in my ordained life, so perhaps don’t fully understand their use. Thanks, Keith. I can’t locate your reference in CofE’s LENT HOLY WEEK EASTER (and I can’t immediately put my hands on Mitchell). I write about omitting the blessing in Celebrating Eucharist. In the Roman Rite, the blessing is not optional. 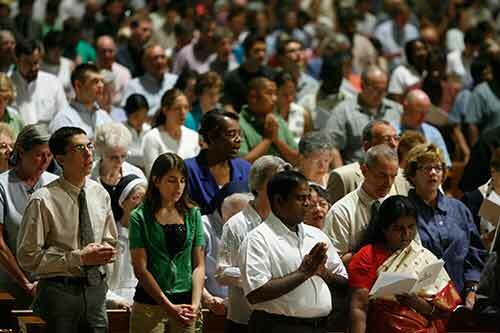 The Prayer over the People is optional in weekdays in Lent and required, as well as the blessing, on Sundays. Blessings. It’s been a while – Happy Easter! BTW – and this is not to belabour anything. Simply, my reference was not in CofE’s LENT HOLY WEEK EASTER but Mitchell’s book by that title. I don’t see any of the Common Worship material mentioning these Prayers over the People. One thing I am going to try this year for the first time, and I will get this from Common Worship, is Stations of the Resurrection. Images/’pictures’ for this is certainly harder to find than for those of the Cross! Enjoy the Great 50 Days! Thanks, Keith. One would think it is fitting and right that images of the Resurrection are harder to find 🙂 These two links may help: here and here. Easter Season Blessings. Quite true, Bosco – no-one saw it actually happen! Everything seen is post-resurrection. While somewhat frustrating, I am enjoying the search for appropriate images. And many thanks for the links – look forward to exploring them. A blessed Eastertide to you.